Other Designers Men's Watch - Black,Red. Other Intelligent Health Bracelet M3 Smart Bracelet Fitness Tracker - Black. Wristwatches do more than keep time; they make a strong fashion statement and over the years have become an integral part of a man’s fashion accessories. Whether a wearer wants to exude simple elegance with a gold or titanium wristwatch or demonstrate a flair for fashion with a cuff watch, he or she can find a large selection of watches for men in every price range, on Jumia. However, before buying, it is important to determine the type of watch needed and the preferred material and features. Even the best-dressed men can get it wrong when it comes to buying the right watch. Truth be told, men's watches are quite complex, can be expensive and there are a lot of them out there. When buying a wristwatch, it is important to ask key questions like when you’ll be wearing it, what you’ll be using it for – work, going out, sports or just lounging, and ultimately, how much money you want to spend. The method of timekeeping used by a watch is called the movement. Whether looking for a wristwatch or pocket watch, first, choose between a battery-powered quartz movement and a mechanical movement that requires winding. Quartz movements, the most common type of watch movements, offer accuracy and stability. Plus, quartz watches do not require winding and the battery should only need to be replaced once every one or two years. Quartz watch faces also come in several styles: analogue, digital, and ani-digi. Analog watches have numbers, Roman numerals, or tick marks indicating intervals of time. They are the most traditional design, but there is also considerable freedom in how they look. Digital watches have digital faces that provide an exact readout in hours and minutes. They often have extra features such as calculators and compasses while Ani-Digi watches include the numeric elements of an analogue watch face as well as a digital display. The faceplates of quartz watches can have a simple look, or a novelty design featuring cartoon characters, animals, or sports themes. Also, when selecting a wristwatch, the face of the watch can make a considerable difference in the design, style, and durability. Watch faces range in design from styles to dress up an outfit, to those worn for sports and other physical activities. Another consideration is selecting the type of band. A watchband can change the entire look of the timepiece, and there are two styles: bracelets (composed of metal or precious metals) and straps (composed of plastic, rubber, or leather). Some strap style bands may be interchangeable to provide greater flexibility. Careful use is always the best guideline when wearing a watch, although time and exposure can cause wear and tear. Tools and replacement parts can help maintain the life of a watch. Batteries, extra links for bracelet bands or replacement straps, and watch inserts can help maintain the life of a watch. If you’re looking to top quality men's accessories like wristwatches, men's bracelets, and more, then you’re certainly at the right place. 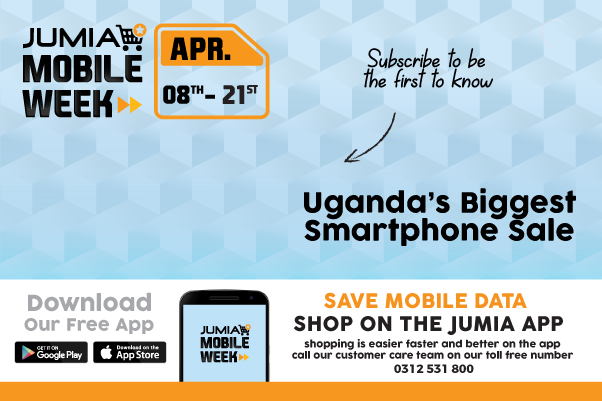 On Jumia, you can get the best deals for just about anything you may need and want in Uganda. We offer a wide range only on Jumia. You could also use the filter search feature to help make your shopping experience faster and you can select according to brands and prices. Order yours today and get the best hassle-free.